Warning for loyal drivers: 45% of major auto insurers unfairly hike up loyal customers’ rates just to maximize profits – insurers call it “price optimization” (in a Consumer Fed report). The loyalty discount looks good on the surface: you may save 10% off your premium! But in reality, your rate really might be going up by 25% at the same time. So that 10% off is no longer saving you money. 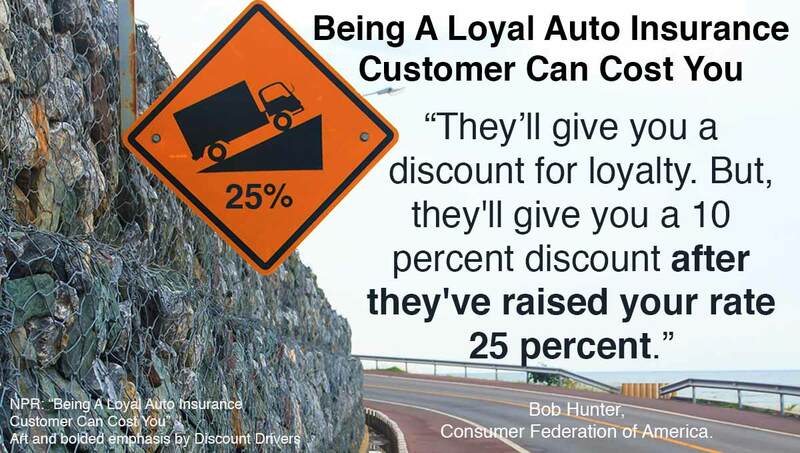 They’ll [car insurance companies] give you a discount for loyalty. But, they’ll give you a 10 percent discount after they’ve raised your rate 25 percent. — Bob Hunter, Consumer Federation of America on NPR. Drivers have discovered a trick. You can get a discount about the same as the “loyalty” discount–and avoid the price surge. Here it is: If you decide to switch insurers, make sure you switch at least 2 weeks before your current policy expires because we found 6 insurers that give a significant “early signing” discount. You should also be refunded your remaining balance from your current insurer. This is what many drivers have found out to be the easiest way to maximize savings and avoid rate hikes. Compare rates here and keep your insurer honest.